Today began and ended with disappointments - but the middle was better than middling. There was a helicopter flight scheduled for this morning, but the driver taking us to the helipad got a phone call shortly before we arrived to tell us that mechanical problems meant it had to be cancelled. Now, while the last thing I would want to do (probably literally) is to get into a helicopter with mechanical problems, that was a shame. Dubai would be very spectacular from the air, especially with all those artificial islands they've built, and choppers are so good for that sort of viewing. Sigh. 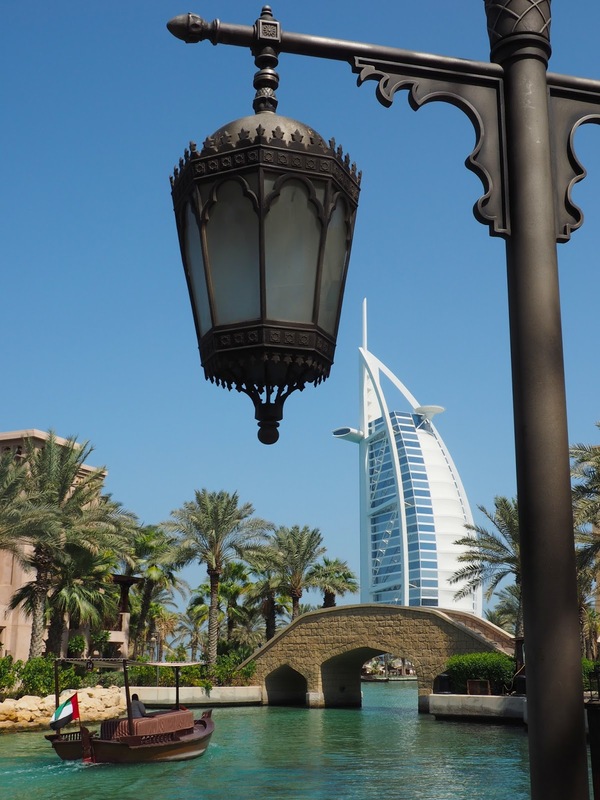 So instead we explored the Souk Madinat, with its views of the Burj Al Arab, which isn't at all authentic - the James Blunt soundtrack was a bit of a giveaway - but is elegant and pretty, and free of all the eager, full eye-contact stall-holder hassle that can make the real thing a bit wearing. We stopped to admire and disparage the authenticity of names written in coloured sand inside bottles, and then the man showed us how he did it, and it was impressively real and clever - if perhaps one of the world's more dispensable skills. The Big Bus took us to The Palm, five km long and wide, and the only man-made thing visible from space they say (forget that old Great Wall of China chestnut) where we explored Atlantis, the big hotel at the end, where our tickets got us into the aquarium. 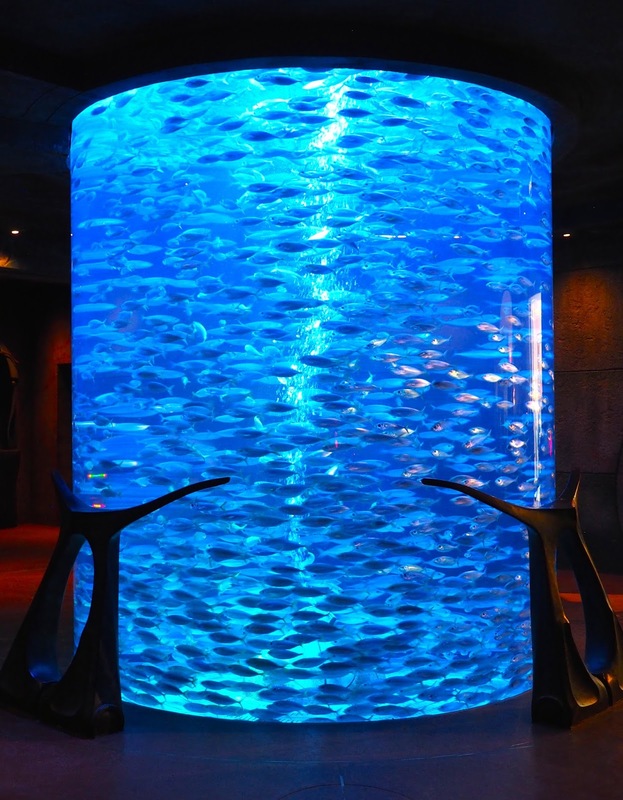 It was themed on, guess, Atlantis, with lots of Greek stuff in the tanks, but mainly it is fish as interior decoration, which seems pretty rough on them, especially the endlessly-circling ones in the tall column at the entrance. But it was hard not to get sucked into how pretty they look in the clear water, and how varied. Plus, albino alligators! Then we took the BB back to the Mall of the Emirates, whose gimmick (apart from hundreds of high-end big-name shops, more affordable ones, a Carrefour supermarket and acres of marble) is its ski slope. There is actual snow in there, people sitting on ski-lifts being carried up to the top (and, confusingly, down again too - though some of them did have snowy skis on), kids on luges, alpine buildings, and lots of people togged out in snowsuits and boots enjoying the novelty, the little kids absolutely astonished at how if you touch it, your hands get cold. After a swim in the pool on the Sheraton's roof - air temperature 35 degrees, water 29 (they did have a second, cooled, pool, but it wasn't that popular) gazing at the hazy view of clustered skyscrapers, acres of housing and flat-roofed businesses and, beyond it all, sea and sand to the horizon, we took the Metro to the Burj Khalifa mall for dinner. New, clean, elevated, cheap (AED8 for 2 zones), frequent, simple to work, and full of polite people who offered up their seats to decrepit old types like us, it is an enviable system. And, at the BK end, there's a kilometre-long travelator (in sections) taking everyone into the mall - all dressed up in their Friday finery, and a delight to the eye. The women looked ok too. Dinner at the Italian restaurant Bice Mare in the adjoining Souk Al Bahra was delicious, attentively-served and so filling we unfortunately couldn't manage dessert - even so, the main attraction there is its overlooking the fountain, which performs every half hour through the evening. Modelled (like so much else here) on Las Vegas, specifically Bellagio, it's big, high, fast, noisy and musical, and irresistible. Also even-handed: the first had Arabic music as its sound-track, the second show was to the Magnificent Seven theme tune, and the third classical - all appreciated by the gathered crowds who clapped enthusiastically afterwards. But boy! did all that evaporating water in the air make things sticky and humid for us out on the restaurant's verandah. Oh, and the plebs down below too, presumably. And then, the day's closing disappointment was that we missed the Big Bus's night-time tour, because we didn't read the brochure properly, and finished dinner too late. Oh well.